This is the quilt that started it all. This weekend I was invited to a birthday party. We have all been invited to many birthday parties in our lifetimes. What makes this birthday party so special is that it was a party for a friend – a friend who is a Quilter. When I moved to Maine 4 years ago I knew a few people. I really would not have considered any of them friends. They were acquaintances. Then I joined a Quilt guild. Quilters are such wonderful caring and sharing people. One of the first projects that I got involved with was a raffle quilt. We met a few times to cut fabric, make packets for members and eventually to assemble the quilt. 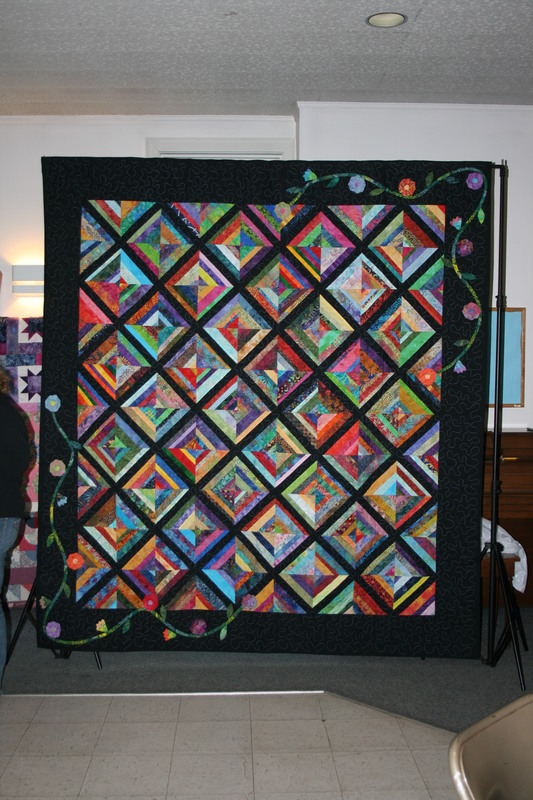 The person who was the chairperson of the raffle quilt is Ardy – I went to her birthday party on Saturday. As a result of my participation in the quilt chapter I have met FRIENDS. People, who I can call on in a times of need, people who I quilt with and laugh with and eat gum drops with and do charitable work with. When I look back at my life I have made my best friends through either church or quilting, two organizations that as their goal is to comfort people. This month my quilt group is making tote bags for a battered women’s shelter. We will make handmade quilted tote bags and fill them with things that we take for granted in life, toiletries, socks, underwear etc. These woman run and they only grab their kids and what they can carry which usually isn’t much. So thank you Ardy for inviting me to your birthday party and more importantly thank you for being my friend. Thank you quilters for being the kind, welcoming, giving, fun, caring people that you are, I am very happy to call you my friends!